It was our first day of the 2012-2013 school year. Why did it go so well? Did I luck out with a great group of kids? Well, I told them that was why, but I know from last year's teachers that as always, I have a mixed bag of personalities and abilities. Was it because I was so well rested after a long summer? Nope, I had my usual nightmares the night before school (This one featured the kids completely ignoring me and hiding to avoid working). Was it because of the caffeine? Well, yes it was partly because of the caffeine. But mainly the reason my day went so well was...PLANNING. *I plan my first day of school starting the last week of school the previous year. *The way I pack textbooks (or rather, the way I enlist students to put away their own textbooks) is designed to facilitate easy distribution for the next year. 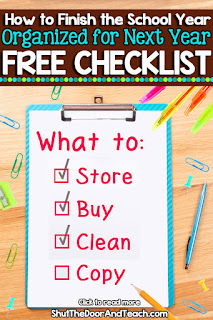 *I have a carefully designed back to school to do list (free to download if you're interested) that helps me stay on track in terms of time and task (for example, instead of daily trips to the laminator the week before school, I have a list of everything to do at once in July). I aim to be "ready to start" the week before the kids arrive, and keep the "It would be nice if I could..." tasks for that week. That way I feel very relaxed and ready well in advance. *I have a system for "surprise students" that are switched to my room, or who moved to this city over the summer, so that although I have to write their name on everything, everything they need is accounted for. *I carefully plan the day's flow, and change it according to cues from my students. Of course we do this every day, but it's never more critical than the first day. The children aren't the only ones who need to make a good first impression. I need to come across as organized, calm, good at explaining things (in this case routines), fun, but not TOO fun, interested, nurturing, but not babying, smart, but not unapproachable, authoritative but not terrifying, and so on. I keep a list of things that MUST be discussed and done on the first day, and check it off whenever I have a spare moment, but I keep in mind that the rest can be done later in the week. The important thing is to balance me informing, with kids demonstrating what they remember/can do, with movement to different parts of the room. *I decorate. It makes me feel happy to be in my classroom. *I use a lot of "us." For example, "Think of 2 to 5 rules you had last year that you want us to have this year." The way this directive is phrased is a little Jedi mind trick. "You WANT rules and structure." "Yes, here are rules WE WANT, teacher..."
*Of course, I have my own set of expectations about why we have rules and what those rules need to be already firmly in mind, so as the week goes on, their list gets tweaked. I'm open to change, but I always keep my goals of safety and learning at the forefront. That's what helps me decide what I need to make sure to tell them about that first day and week as well. *I drop in little tidbits about myself, but only in the context of learning about THEM. Our school does Morning Meeting, so I have a pretty widely used "Find someone in the room who..." type paper, and in passing mention "I have 2 cats too. I don't really have a favorite color either, since I love all fall colors the best," and so on. I figure they'll hear my voice enough the first day because they are so dependent on me in their brand new surroundings; they don't need to hear my bio too (yet they need to START to get to know me too, in order to make a connection they care about).